PhotoPlus Expo is my favorite trade show of the year. The big companies present their latest and greats products for photography and digital imaging. But, it’s the smaller companies that usually have the surprises. This year was a different story. The gloomy economy scared away many exhibitors including such regulars as Adobe, Apple, Tenba, OnOne Software and Vertus. 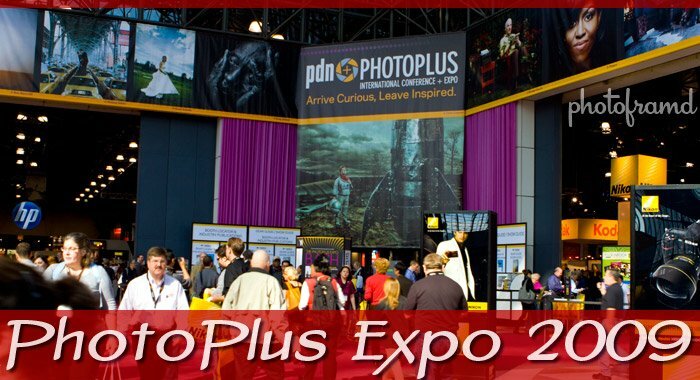 In fact, this is the first year that PhotoPlus did not use the entire Javits Floor. Usually I pass on the seminars, but this one was interesting. Vincent Laforet took his weekend seminar and condensed it into 3+ hours. He provided a look into his typical video production. All the equipment used on your typical movie set has been scaled-down to work with the DSLRs like the 5D Mark II, 7D and the 1D Mark IV. The seminar was sponsored by Canon, so the concentration was on Canon equipment. But, the most interesting piece involved Canon’s IS (Image Stabilization) lenses and the 7D. With the introduction of the 7D as well as the 1D Mark IV, the lenses IS will stay active while shooting video! Now, these lenses were not designed for video stabilization (extended IS operation), so the results will not be 100% as good as a video camera with true IS control. But, it is a start. Thankfully, the companies that did exhibit brought the goods! Canon: The Canon booth was very busy with the recent introductions of the 1D Mark IV and my 7D. And, almost every photographer was asking about HD Video. Canon had some great speakers including Vincent Laforet who last year broke ground with the first 5D video short, Reverie. This year, he created a new short called Nocturne filmed in 6400 ISO with the 1D Mark IV. Canon for some reason requested that he remove the video for the time being. Laforet said that he had a similar problem with Canon last year over fear of “publicly” revealing the new camera body before the official announcement. Even the Nikonians were walking through to see what all the fuse was about. Nikon: As expected, Nikon was promoting the new D300s. Hoodman: Introduced an upgraded HoodLoupe 3.0 last year which has really taken off. If you have looked at Red Rock Micro, the HoodLoupe is incorporated in their rig. They are also about to release a new series of CompactFlash cards with a x600 speed rating. Sandisk: Just to confuse thing further, Sandisk also introduced a x600 speed rated card series. Instead of calling it Extreme V, they are calling it Extreme Pro. Olympus: The new EP-1 is small and powerful Micro Four Thirds. This amazing camera is smaller than the Canon G11, and just as sturdy. With its cool retro styling and excellent images, it is winning a lot of praise. Sigma: With a larger booth than last year, Sigma finally had the room to display their 200-500mm f/2.8 bazooka! Wacom: Have you ever though about using your iPhone to replace your computer’s mouse? The is essentially the idea behind Wacom’s new Bambo line. These new writing tables now support both multi-touch as well as pen-ready for a broader appeal beyond graphic professionals. Kata: Located in the Bogen group was bag maker Kata. On display was a very cool E-702 Elements Cover designed to protect the camera from rain and harsh weather while keeping the front element exposed. Kata now has a line of these Element covers to fit large lenses, point-n-shoots and camcorders. Trek-Tech: Expanding on their TrekPod monopod/tripod hyrid, they introduces a TrekPod Go Pro which will fit in an overhead carry-on. Topaz Labs: Easily the best bundle deal at the show, Topaz Labs is offering a bundle of Adjust, DeNoise, Simplify, Detail, Clean 2, ReMask and DeJPEG for only $150! The Coolest Product of the Show! Leave it to brand-new company to offer the most innovative product at PhotoPlus. 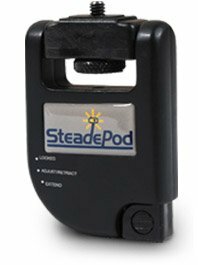 Cameron Products introduced the SteadePod. For under $30, The SteadePod mounts to your cameras standard 1/4″ screw-mount and incorporates a lanyard system to stabilize your camera during hand-held operation. Basically, the lanyard creates enough tension to steady your camera without the need for a tripod. Just pull out enough line, lock it in place and secure it to your belt, and you are ready to go. So simple and so effective. I was skeptical at first, but I tried it. I was hooked…literally. In fact, it worked so well that I used it to shoot my latest YouTube video filmed on the floor of PhotoPlus Expo! Still video, panning video, even moving video locations all worked beautifully. I was shooting with the camera just above my waist using my 24-70mmL lens (a lens without IS). It was high enough for me to see the LiveView screen while creating an interesting viewpoint to record. I spent two hours walking around the show floor filming with my 7D. The video was very impressive and completely hand-held! Take a look at the video and let me know what you think. The more I used it, the more stable the results. In the final shot, I am spinning around using my feet and the video is very stable! ← Previous Previous post: HDR or Adjustment’s in Camera Raw – Which is it? Next → Next post: Canon 7D Tips – What’s that sound? Very impressive and now I have to buy one for my 5D when I get it! Thanks for the video demo for the SteadePod! I purchased one for my Kodak Zi8! Glad to help. It is a handy little gadget to keep in your camera bag! I just purchased this little gem, to go with my T2i Rebel, I have a L lens, with stabelizer, however, this will still come in handy, when I need a tripod.